You must MASTER this control! 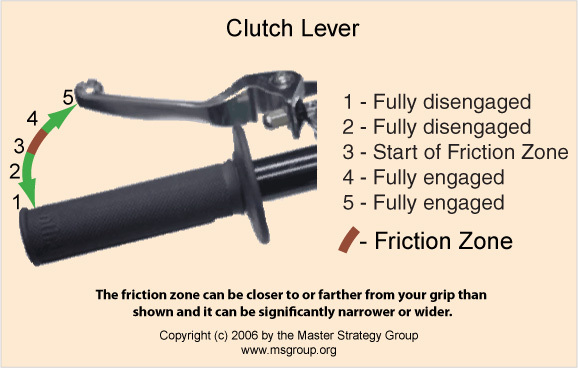 The friction zone is that part of the clutch lever travel from where the clutch just starts to engage until it is fully engaged. In the picture below it is the range between 3 and 4. If you constantly stall or have awkward/erratic (jumpy) starts when you operate the clutch lever then the problem is that you are releasing the clutch lever too quickly - more to the point, you are failing to hesitate while in the friction zone (between 3 and 4 in the diagram) as the engine speed and rear wheel speed synchronize before easing that lever all the way out. Phrases like "release the clutch lever" or "ease out the clutch" do NOT mean that you are to release that clutch lever all the way out! I know, somebody should have told you that when you were learning to ride, but they didn't. Those phrases really meant that you were to ease out the clutch lever UNTIL you reach the friction zone and then you are to HESITATE there until the engine and the rear wheel speeds synchronize. THEN, you ease the clutch lever all the way out. If you are starting from a dead stop this is particularly important as the rear wheel is turning at zero rpm while the engine is turning at more than 1,000 rpm. Nothing that you can do with the clutch lever while it is outside of the 3-4 range makes any difference whatever to the motorcycle. You can move it quickly or slowly, in small or large increments, and the clutch lever outside of the range of 3-4 does nothing. So it makes sense for you to become INTIMATELY familiar with that zone. As the clutch lever can save your life, can get you OUT of most control problems with your motorcycle, you MUST MASTER its usage before you begin testing your skills with any other motorcycle control.